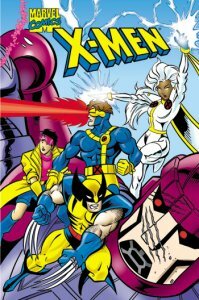 Your Child will join Wolverine, Storm, Cyclops and the rest of the X-men in a personalized adventure to protect town from the future threat of the Sentinels. Your child will have a pulse pounding time as he joins the legendary X-Men and becomes a hero too!!! James Smith, Age 7, of Canton, Michigan, was playing a video game at the mall. Suddenly he heard someone yell, "Oh No! not again!" Chris turned around and saw a teenage girl standing in front of a game that was shooting out electrical sparks. "Um, I guess there's a short-circuit in the machine," said the girl. "Hi, my name is Jubilee." What Chris didn't know was that Jubilee was a member of the X-men. Jubilee had special powers that caused the machine to malfunction. Just then there was a huge explosion! Chris and Jubilee emerged from the video arcade and saw a giant robot crashing through a glass wall at the entrance to the mall. "It's a Sentinel, a robot built to hunt down mutants!" said Jubilee. "You'd better stay inside the arcade. My friend Storm and I will deal with this. A blast of energy shot out of Jubilee's hands and smashed into the Sentinel. "I sure wish John, Tom and Ryan could be here right now," thought Chris. Chris could hardly believe what was happening! Just then, someone else joined Jubilee. The new arrival was able to fly and caused a giant windstorm to surround the Sentinel. But that wasn't enough to stop the robot. "Thanks for joining in, Storm," called out Jubilee. "But I think we're going to need a big can opener to stop this metal menace." Chris realized that Jubilee and Storm needed help. Thinking fast, Chris ran to a hardware store and grabbed a garden hose. Then Chris ran faster than he ever had before. He zoomed at lightning-speed around the Sentinel, looping the hose around the legs of the robot. Unable to move, the Sentinel toppled to the ground. Chris had stopped the robot. "Did you see that?" gasped Jubilee. 'I think we should have a chat with Chris," said Storm. Chris was exhausted. He sat down on the floor of the mall to rest. A man joined Storm and Jubilee, and the three of them walked over to Chris. "Nice job stopping that Sentinel, Speedy," said the young man to Chris. "My name is Gambit, and we're members of the X-Men." How would you like to come with us to Professor Xavier's school so we can learn more about your mutant powers?" "Mutant?" said Chris with surprise. I'm a mutant?" Chris traveled to the X-Mansion where he met Professor Xavier and the X-Men team members. "Being a mutant means that we're born with something extra in our genes--something that gives us each a unique power," explained Gambit. "But how do I control my powers?" wondered Chris. "I didn't ask to be a mutant." "No one ever does, sugar," said Rogue. "But you're not alone, we're here to help you." In the corner, Wolverine and the beast were reviewing a computer screen that showed several Sentinel robots. "I hate to break up your little tea party," growled Wolverine, "But it looks like the Sentinels tracked Chris back to the X-Mansion. We're about to have visitors." CRASH! A Sentinel blasted through the wall. A dozen more Sentinel robots were right behind, ready to attack! The X-Men began to battle the intruders. Wolverine used his claws to rip open one Sentinel's arm. "Chew on a plasma blast, pal," shouted Jubilee as she zapped a Sentinel. Cyclops blasted one robot, and Gambit tossed an explosive playing card. But there were too many Sentinels. Chris realized he had to do something to help the X-Men. With his new found powers, he started speeding in one big circle around the Sentinels, zipping around them faster and faster. The plan worked! The Sentinels had only been programmed to deal with the X-Men. The robots didn't know how to react to the super-fast running powers Chris possessed. As Chris distracted the Sentinels, the X-Men teamed up to smash the Sentinels into little bits. "Outstanding Job, Chris!" said the Beast. "You were great, Chris," said Jubilee. How would you like to stay in the X-Mansion for a while? "Thanks," said Chris, "But I need to go home. John, Tom and Ryanwill be waiting for me. "At least we can drive you home," offered the beast. Professor X smiled and said, "You're always welcome here, Chris. Who Knows? Perhaps in a few years you'll be able to join the X-Men!"